The supply of higher end properties priced at RM1 million and above may surpass the demand as buyers turn cautious. However, things may not dramatically worsen as an expanding working population in growing cities around the country will keep demand in the affordable housing segment steady in 2015, according to speakers at the Property Market Outlook for 2015 seminar. “The property market is expected to moderate in 2015,” said Valuation and Property Services Department deputy director-general Faizan Abdul Rahman. “Nevertheless, the residential property market will continue to sustain, underpinned by the growing working population and first-time home buyers. However, the demand will most likely for properties below RM500,00, while high-end housing above RM1 million is likely to wane, said Faizan. From January to September 2014, more than RM124 billion worth of property was transacted, a spike of 15.8% compared with the same period in the previous year. Volume, however, expanded at a more moderate pace. Moody’s Investor’s Service, a rating agency, expected demand for residential property in Malaysia to slow further in 2015, due to property cooling measures imposed in 2013 and weak buyer sentiment. 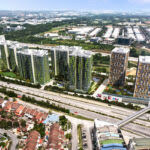 Developers with residential projects in Johor, Kuala Lumpur, Selangor and Penang may face the greatest challenge in achieving their sales targets. “Currently, there is an oversupply of high-end condominiums and offices,” event organising chairman and VPC Alliance chartered surveyor and director James Wong said. This was evident, he said, as property developers had been launching fewer projects in recent months. Wong also said there had been a rise in property auctions, while banks were getting stricter in approving housing loans. “We have been seeing correctional signs since the fourth quarter of 2014. Coupled with the oversupply, we suspect this will not be a good year for the property market,” he said. “Developers have a statutory requirement to build 30% low-cost housing,” Wong said. However, as the cost of land in KL City is relatively more expensive compared with the rest of the country, developers may have to cut their profit margin to offer affordable housing in the city. To boost the supply of affordable housing, the Government has come out with several initiatives such as the 80,000 units under PR1MA for household incomes up to RM10,000, the 26,000 units under the National Housing Department (Program Perumahan Rakyat), 37,000 units under Syarikat Perumahan Negara Bhd and 5,380 units under the Program Perumahan Penjawat Awam 1Malaysia (PPA1M).